My recent wedding reception saw a reunion of my old band The BOI. 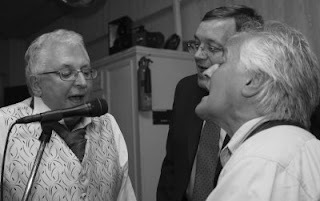 It’s been donkey’s years since the three founding members – Drew Millin, Roger Parker and myself - were all last together. If I remember correctly, it was in Rog’s front room to record a number for a song-writing competition run by Watney’s brewery (maker of infamous Red Barrel). We came up with a number called ‘Get It Down You’ – about drinking beer, thinking this might give us an edge and help us to win. It didn’t work. We’re now planning another get-together later this month to see Drew deliver one of his legendary performances at the Hole in the Wall pub in Torquay.